Playing on saxaphone Lucas Bere (right) is a member of the Brubeck Institute Jazz Quintet he is playing alongside guitarist Shawn Britt during the March 10th show. Jazz pianist and professor Joe Gilman performed seven songs with the Brubeck Institute Jazz Quintet with compositions ranging from energetic vibes to somber songs in music room 547 on March 10. The Jazz Quintet players improvised songs that they composed and wrote themselves. The Jazz Quintet are a group of young adults ranging from major cities in the United States e.g. Boston to Stockton, with the saxophonist Lucas Bere who currently lives in Roseville and bass cello player Sara Quo from Stockton. Gilman has been with the Brubeck Institute for several years. Gilman brought the music of jazz to ARC. “Jazz is one of the most important indigenous art forms from America … It represents the blending of cultures from around the world … where we have freedom to express ourselves independently,” Gilman said. Gilman focused on the performance of jazz musicians of the Brubeck Institute at ARC not being just for enjoyment, but for students to learn about the importance of compositions played in jazz. 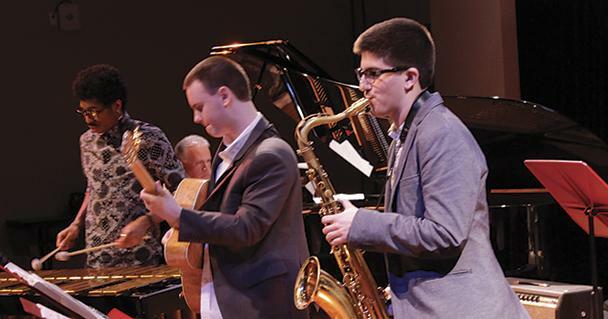 “They [Brubeck Quintet] are some of the best young musicians in the country and I thought it would be good for the students at ARC to meet them, hear them [Brubeck Quintet] play, and make connections with them,” Gilman said. Lucas Bere, a member of the quintet, is a local jazz saxophonist from Roseville, Ca. The show began with a piece called ‘Is It Love That Inspires You?’, which opened up with a lot of energy and showcased solo introductions performed in the musicians’ styles. Guitarist Shawn Britt from Boston played the first solo in the song, “Is It Love That Inspires You”. Vibraphone player Joel Ross from Chicago accompanied him with Gilman on the piano. “I enjoyed ‘Is It Love That Inspires You?’ for it’s rhythmic phrasing,” Gilman said. Rhythmic phrasing, according to Gilman, is improving on the spot. Gilman played a complex piece called “Hinterland”. Written by drummer Jaylene Archy from Houston. “I enjoyed ‘Hinterland’ for it’s challenging form,” Gilman said. Gilman played a piece entitled ‘4 Freedoms’ that was written in relation to a Saturday Evening Post photo of a Thanksgiving family dinner drawn by Norman Rockwell. Gilman’s piece gained admiration from the audience in an arousing applause. The concept was a commision from the Crocker Art Museum, according to Gilman, but there was a personal connection that Gilman sought from performing this piece. “It reminds me of simpler times, the importance of family values, and communication between loved ones,” Gilman said. The story behind this piece was that Gilman felt that families can connect together at the dinner table. An example Gilman used was a reference to the opening tune to a classic TV show called “The Waltons”. Gilman also commented on other shows that will be performing on campus. The next Jazz ensemble will be an instrumental composition, where the ARC Latin Jazz, Studio Jazz Ensembles, and the ARC Jazz Collective perform a tribute to the music of the Thelonious Monk Big Band with arrangements by Oliver Nelson. Be the first to comment on "Professor performed alongside multi-award winning collegiate jazz group"